Honor has just launched a new mid-range flagship device in the UK, Europe, and in the US at CES 2017. 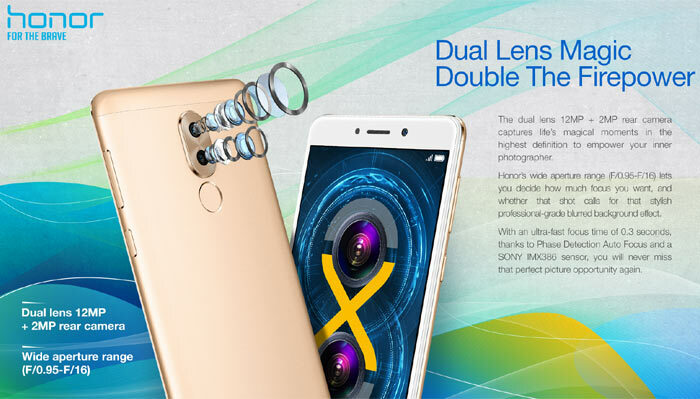 Among its headlining qualities Honor claims the 6X is the "world’s first smartphone with a dual-camera for under £250". That's definitely not all though, the supporting specs are also rather good, and the new Honor 6X comes packing; a 5.5-inch Full HD screen, Android 6, a Kirin 655 octa-core CPU, a battery with enough stamina for "up to 2.2 days", and a fingerprint sensor. As Honor boasts about the 6X's camera above all the other specs, we will look at its photography credentials first. Round the back of the phone is the main event - a dual lens 12MP + 2MP camera configuration - said to provide swift, crystal clear shots on demand. A very wide aperture range from f/0.95 - f/16 provides plenty of scope for depth of field effects. The main sensor is a Sony IMX386 and it offers phase detection autofocus (PDAF) and a claimed focus time of just 0.3 seconds. Honor's use of a supporting cast of Prim ISP and DTI pixel isolation tech with the sensor's 1.25 micrometre pixel size help this smartphone's photography aspirations along. The front facing camera is an 8MP unit with 77 degree wide angle view plus, again, the use of the Prim ISP for fast processing. 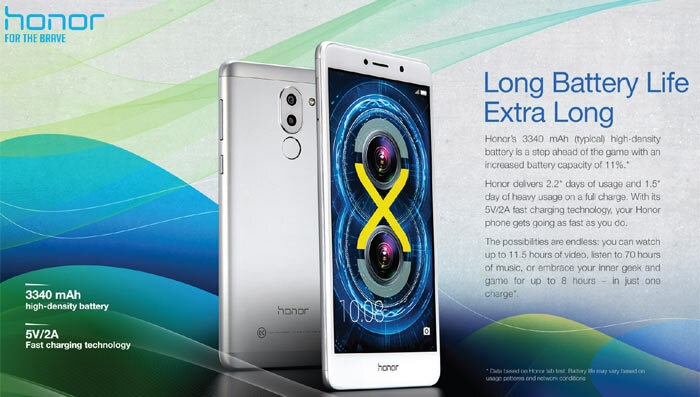 Honor has fitted a 5.5-inch full HD 403ppi display to the 6X. It boasts brightness up to 450 nits, low blue light mode, and the whole phone is wrapped in a 2.5D scratch resistant glass coating. A great camera on a smartphone isn't of great utility if the rest of the phone lets it down with poor responsiveness, lag or similar irksome ill-effects. Under the bonnet of the Honor 6X you will find a good array of hardware to make sure this mid-ranger punches above its weight. The Honor 6X is powered by a 16nm Kirin 655 octa-core CPU supported by 3GB/4GB of RAM (depending on region). Meanwhile, the standard storage capacity is a generous 64GB. Another excellent quality, if it is as good as claimed, is the 2.2 days of average usage you might expect from your Honor 6X. There is a 3,340mAh battery, with 5V/2A fast charging fitted which delivers a claimed 11.5 hours of video playback or a full 8 hours of smartphone gaming. Other important specifications of this smartphone not mentioned above are; the responsive fingerprint scanner which can unlock your phone in 0.3 seconds, Android 6 is installed with the EMUI 4.1 interface, and a device thickness of 8.2mm. 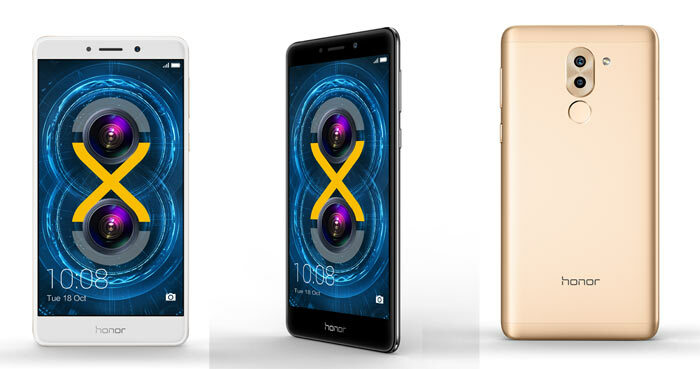 Honor says that the 6X will be available from tomorrow, in grey, gold, and silver finishes from the Honor vMall site and Amazon.co.uk. Remember above it said the initial retail RRP would be under £250? Well it’s set to retail at just £224.99 from launch day. The phone will also become available in contracts with Three from the end of the month. New yet only Android 6. Why bother? You get an extra surprise today…not sure what! My S5 has a 16MP camera… is that not better than 12, then? How is 5v and 2A ‘Fast Charging’?